As of today the “Sino-Danish Pilot Project on District Heating (DH) and Energy Efficiency (EE) Improvements in China” has been signed by the Danish Energy Agency (DEA), the National Energy Conservation Center (NECC), the Development and Reform Commission of Shaanxi Province (SXDRC) and the People´s Government of Tongchuan City of Shaanxi Province (SXTC), in Xi’an- Shaanxi Province. Based on Danish experiences, the new pilot project will be setting the benchmark and foundation for future nationwide planning methods and district heating projects in China. 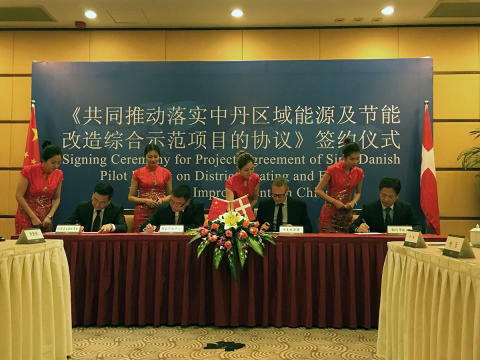 Denmark´s cooperation with China builds on beyond 100 years of Danish experiences with district heating. 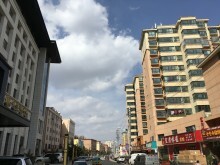 The Chinese Government has ambitious targets for improving energy efficiency and effectively using excess heat resources to district heating in order to reduce coal consumption, improve air quality, ease the fast-growing heating demand (including demand for space heating and domestic hot water) due to the rapid urbanization process and, last but not least, to protect the environment. Both parties agree that with the use of the Danish experience regarding district heating, engaged partners from different sectors and with the qualified support from the Sino-Danish Expert Panel established as a part of the pilot project, the goals of reducing energy consumption, costs and emissions will be met. The project agreement signed today aims to introduce and demonstrate advanced Danish methodologies and technologies as well as experiences in the field of energy efficiency and district heating. Hereby the purpose is to advance the Sino-Danish Pilot Project under the guidance of the Ministry of Energy, Utilities and climate of the Kingdom of Denmark (MEUC), and the National Development and Reform Commission of the People´s Republic of China (NDRC). This pilot project will be implemented in Tongchuan City of Shaanxi Province, working with key stakeholders for the district heating planning process, assessing the possibilities for increasing energy efficiency and utilising e.g. excess heat from Huaneng Tongchuan Zhaojin Power Plant. 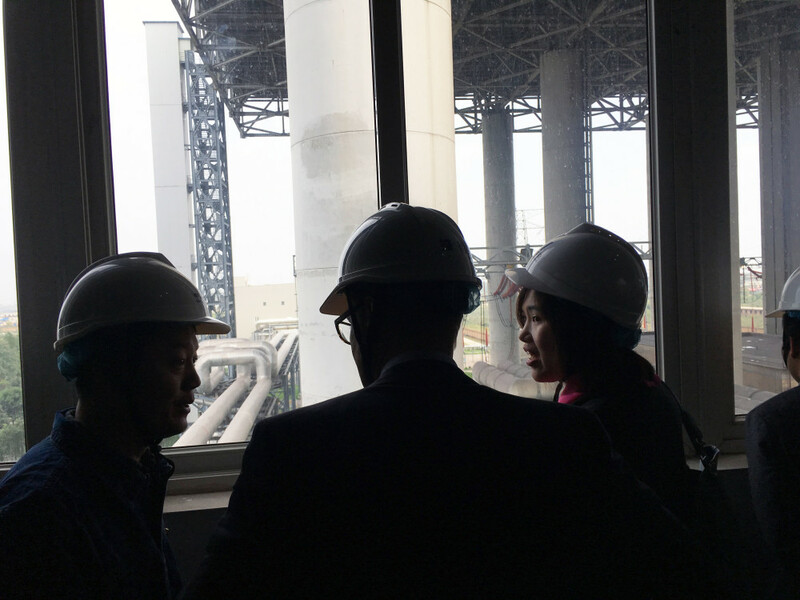 Subsequent signing the pilot project agreement followed a tour at Huaneng Tongchuan Zhaojin Power Plant with a presentation of the aim and content in the pilot project by the NECC and the DEA. Tongchuan had a population of 950.000 in 2015, with a total heating area of 15.99 million square meters. Its weather is characterized by long winters and short summers, where minimum temperatures between October and April are always below zero (-6°to -22°). It is predicted to reach up to 1.06 million inhabitants, covering a heating area of 33.46 million square meters. Its main industry and source of energy is coal, however their industry also includes building materials, machinery, textile and aluminum. Heating is needed in the cold and long winters by the increasing population. The industries and power plants might have excess heat currently not utilized in the district heating system. This untapped resource is a potential the pilot project will investigate and give suggestion on how to utilize in a long termed sustainable way supporting the green goals of the government. 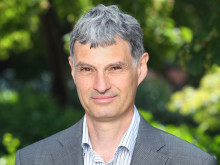 This project agreement is a result of a larger framework of cooperation that started with the Memorandum of Understanding on Climate Change and Energy Efficiency, signed in 2013 by the NDRC and the MEUC. In addition, a new three year Sino-Danish collaboration, between the DEA and the NECC, that aims to focus on DH and EE, is currently underway. This cooperation includes the hiring of a long-term Danish district heating expert based in Beijing, who will support the implementation of the pilot project. One of the most important tools to be used in this collaboration is the District Heating Assessment Tool (DHAT), launched last month by the DEA. The tool performs economic feasibility studies for establishing district heating compared to individual heating. It can be adjusted to local conditions worldwide. Find more information about DHAT. In this fact sheet you can read more about the district heating pilot project. Today, Chinese high level energy officials visit Denmark and the Danish Energy Agency. Denmark has decades of hands on experience in integrating renewables in the energy system, experience that can be of crucial interest to Chinese plans to boost their own green transition. Two Chinese delegations are right now visiting Denmark with a perspective of learning from Danish experiences on utilization of surplus heat and energy efficiency within district heating. The China National Energy Conservation Center and the Danish Energy Agency signed an implementing agreement of a Sino-Danish pilot project on district heating and energy efficiency improvement in Beijing. The Danish Energy Agency (DEA) is publishing a leaflet on how it can help other countries towards a greener future through scenario-based energy planning.